Preference to skulk in the dense foliage of the forest understory. Low light that precludes the use of motion-stopping fast shutter speeds. Dark plumage contrasting with the bright bill. All prime ingredients for a classic tough bird shot. In-habitat wild bird photography in our islands, sans the use of calls and baits (such technique won’t work on this species anyway), is probably among the most difficult in the world. This is a well known fact among local birdnuts. And maybe known as well to many visiting foreign photographers who try (often unsuccessfully) to get good captures of the most number of species in a limited period. The key to getting decent captures of tough-to-shoot local birds is simply to go out in as many sorties as possible. Sooner or later, a birdnut breaks through the tough technicals imposed by the difficult conditions, and be able to grab a decent shot. It’s simply beating the odds by doing many, many attempts. Such is my case with this species. I’ve seen it a lot of times in Mt. Makiling and other places, but it was at Subic rainforest in 2005 when I was finally able to get a useable image. The fine feather detail was reasonably sharp even with the slow shutter speed of 1/60 sec. 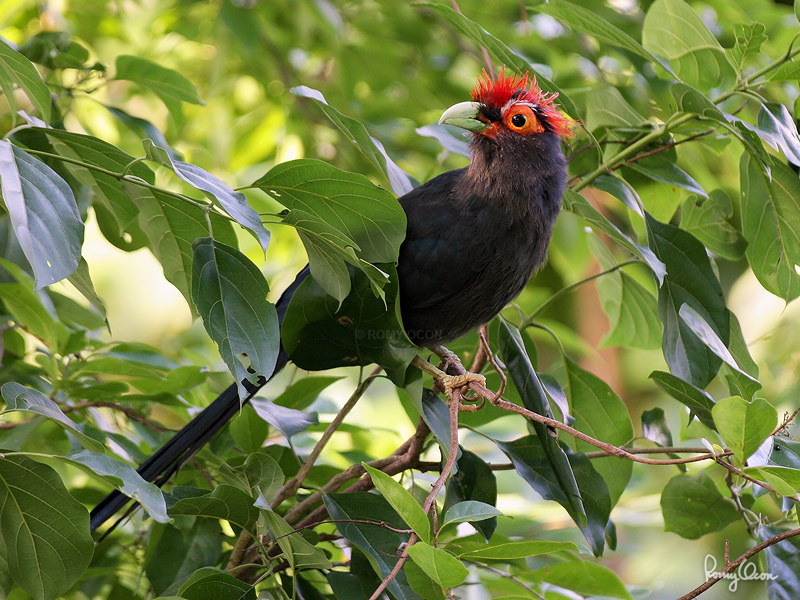 It might not be as aesthetically pleasing as I wish for especially if we go by tame birds or set-up standards, but this image knocked the Red-crested Malkoha many notches down my most wanted list. Habitat – Lowland forest, edge and second growth. Shooting Info – Subic rainforest, Bataan, Philippines, August 22, 2005, Canon 20D + Sigmonster (Sigma 300-800 DG), 648 mm, f/5.6, ISO 400, 1/60 sec, 475B/3421 support, near full frame, available light.